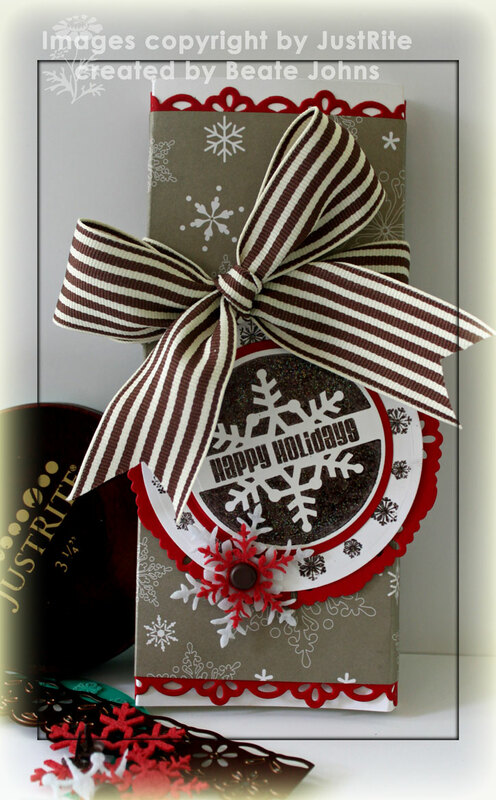 The wrapper base is Whisper White cardstock, layered with Christmas Cocoa Specialty Paper from the upcoming Holiday Mini catalog. 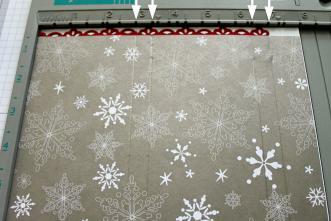 Underneath the patterned paper I added Real Red cardstock cut with Eyelet Borderabilities. Chocolate striped ribbon as tied around the wrapper and underneath I placed my layered sentiment. I stamped the sentiment in Chocolate Chip craft ink on Whisper White cardstock. It was embossed with Iridescent Ice Embossing powder and was cut and embossed with Circle Nestabilities. 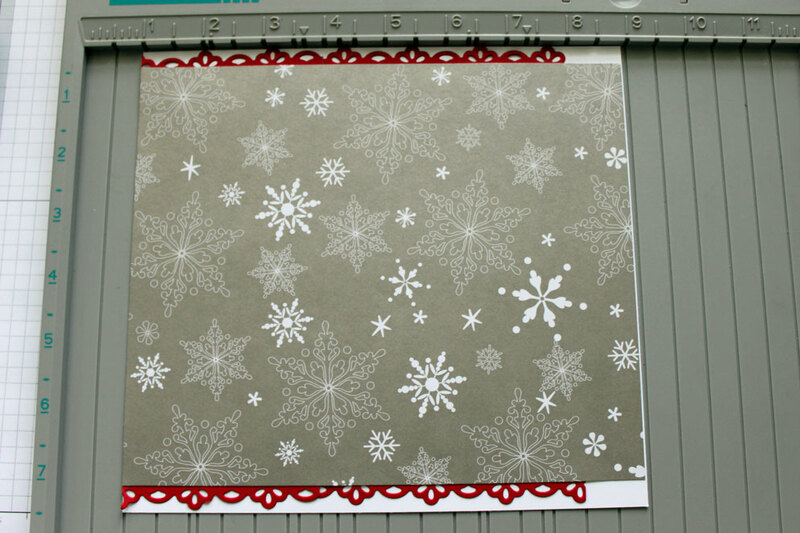 Then I stamped the snowflake border from the same set in Chocolate Chip and embossed it with Iridescent Embossing powder as well. I cut that out with a larger Circle Nestabilities.Under the sentiment layer I added a slightly bigger Real Red Circle cut and embossed with Nestabilities as well. For the base layer I cut and embossed a medallion with my Eyelet Shapeabilities. 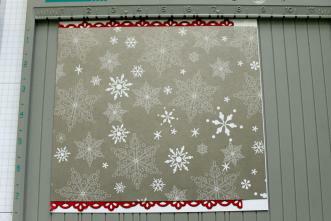 On the bottom right I added Felt Snowflakes from last years Holiday Mini catalog. They were attached to the sentiment layers with a 5/16″ Chocolate Jumbo Brad. The sentiment layer was attached to the wrapper with dimensionals. Measure your candy bar. The length of cardstock cover will have to be a bit longer then the candy bar. You can figure out the length with this formular: 2 x width (here 3″) + 2x the thickness (here 1/2″) and 3/4″ or 1″ as a glue tab. 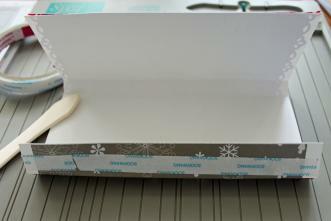 Cut your wrapper base and decorate. Score your layer at 3″ (width of candy bar), 3 1/2″ (width +thickness), 6 1/2″ (2xwidth +thickness), 7″ ( 2x width + 2x thickness). I found out that it’s a bit hard to score more then one piece of cardstock layered with one Designer Paper. The Scor-It might work better if you need to score more then two layers at once. Prefold all the score lines. Add strong adhesive on your glue tab. Tape your wrapper together and slide your chocolate in. Decorate your Chocolate Wrapper. If you tie your ribbon tight, your chocolate shouldn’t slip out. Have fun browsing everyone’s projects. Delicious! Thanks so much for the wonderful tutorial!! Ooooooh YUMMY!!!! What a wonderful idea, beautiful colours and love that gorgeous ribbon and edges!!! Awesome project Beate!!! Yummo! What a fabulous project Beate and love love LOVE those colours and new papers!! Love that little snowflake border! Great tutorial and details. What gorgeous packaging for the chocolate bar! I love it! I love it! That was my favorite set from last Christmas and LOVE your II on it!! GREAT project!!! What a perfect gift…totally Beate style! Love that big bow and the image looks so good embossed with irridescent ice ep! Well Beate, thank you for making me dream of chocolate for the rest of the day, lol! 🙂 What a cute and yummy idea! Now who would want to eat the candy out of this beautifully wrapped candy? LOL Its beautiful Beate! I like the felt snowflakes! I can’t believe that I am going to say this about chocolate, but that just might be too beautiful to unwrap and eat!!! GORGEOUS!!!!!!! Beautifully done Beate – just to pretty to unwrap! Beautiful, Beate — love that new chocolate paper with the red and this stamp is a perfect accent! Your wrapper is gorgeous, Beate!! Everything works so perfectly together with your pretty tag!! Thank you for the wonderful tutorial as well!! Nothing compares to a chocolate bar…especially one wrapped and embellished so perfectly! Hope you are having a marvelous Monday, Beate! Chocolate? MMMM hmmmmm! I love your little wrapper and tutorial and your chocolate stash, too! HUGS! Wow Beate – this is gorgeous and so uber elegant and chic!!! LOVE the project that you have created!!! B-eau-ti-ful!!!! Beate! I love this project. You used the Eyelet Borderabilities and Pendant so creatively. Wonderful job!! So beautiful!!! thanks for your tutorial as always…I have made lot of projects using your tutorials…..love the use of pendant. 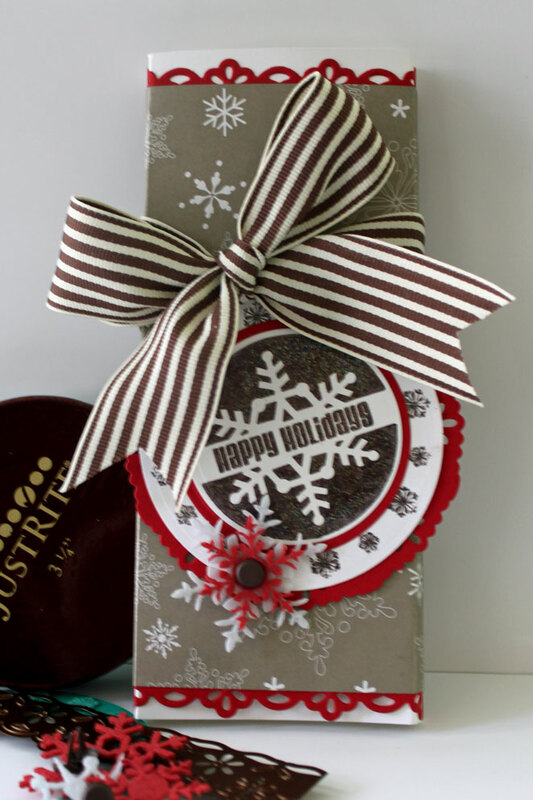 I love covering candy bars and this stamp is perfect with that ribbon. Wow! If this isn’t the best sales job I’ve seen for that new Chocolate paper…I’ll eat it! I’m sold! Thanks for the awesome tutorial too! Great project. These would make nice little gifts. Fantastic tutorial and I love that stamp too! What a fun idea! I love this stamp set, and red, black and white color combinations rocks! fabulous project. mmmmm yummy, chocolate Justrite! How pretty! Yummy project! This DP is perfect for Christmas gifts! mmmmmm!! This is just so beautiful and yummy looking Beate!! Not sure what looks more scrumptious…the chocolate of the ribbon!! I love the addition of the felt snowflakes. Just yummy! I know just the right friend who would love this. Inside and out. Yummy! 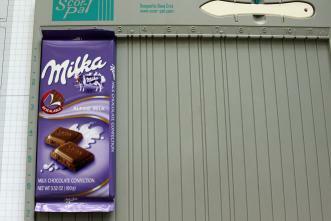 Milka is one of my faves too! And I just love the contrast of the red with neutral colors! Gorgeous! Beautiful wrapper, Beate! Love the sparkle you added to the sentiment and your YUMMY and beautifully tied bow!! So beautiful Beate! 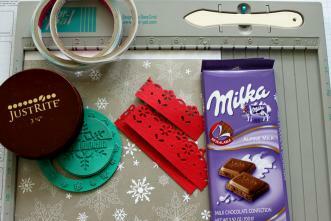 I love the paper you used and love that chocolate CS with the red color. Beautiful work! What a delicious & lovely little treat. Love this idea..will come in handy for all occasions!! Thanks so much for sharing. Adorable! I like Milka too! 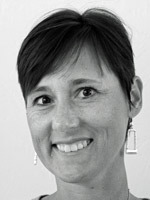 WOw Beate!! Your wrapper looks more delish than the candy in it!! Love it!! What an awesome gift idea!! Mmmmm chocolate! Love the card, colours, everything! 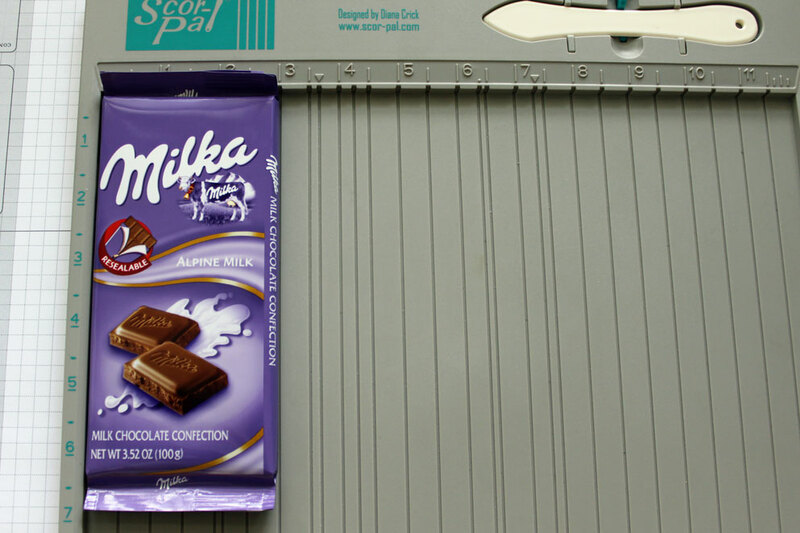 Oh, dear, now you’ve done it… you’ve kicked off a craving for the best chocolate in the world: MILKA!! I discovered this stuff while in language immersion school in Germany (Prien am Chiemsee) in the early ’80s, and have been on a continual quest ever since, in search of MORE MILKA! Any idea where it can be found here in the USA? 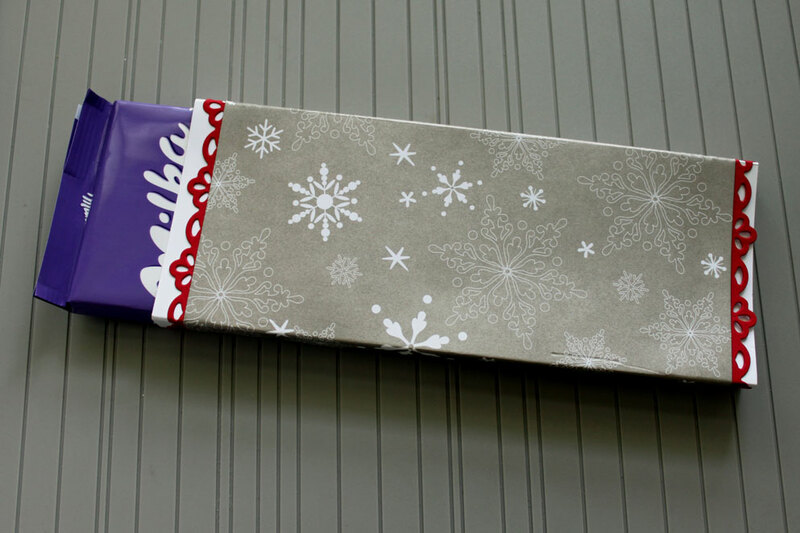 I don’t quite understand the concept of wrapping up MILKA bars and giving them away, even at Christmas (wink), but this is a very pretty project. 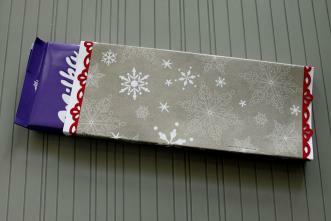 I expect one of these chocolate bars for Christmas, don’t you know? hehe I was planning on buying some of the stampers and now I know that I HAVE too. This great! Love the colors and what’s inside! Yum! This is really pretty, nice colors, and great use of the chocolate YUM! ahhh, elegant and easy…I like this!!! How great is that?!? I love it! Does the winner get the chocolate bar too? You improvised beautifully. Love your contribution. That’s awesome! I saw lots of products like that at the Cologne Christmas Market , when I visited last Christmas! They even wrapped a bag of Haribo!